I have a slight obsession with blanket scarves. Living in Calgary, a city where you can see a wide variety of temperatures within the same day, scarves have become a staple in my wardrobe. Blanket scarves have the amazing ability to transform from a scarf to a cape which makes their versatility that much more impressive. I put together the above look as an #OOTD and I received so much great feedback, including questions about where I shop for my scarves. My secret? Asos! 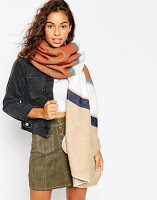 Asos has the best variety of blanket scarves, in my opinion, offering a huge selection of prints and colours. Below are some of my current faves from Asos. Click each image to go directly to the Asos US shop!